During the last two months, heavy rains in two neighboring countries of Iran and Afghanistan caused devastating floods and both countries sustained huge financial damages and casualties. But global reactions on help and assistance to flood-hits in these two adjacent territories have been different. Data and figures show that many countries including US, Saudi Arabia and even Israel who has no diplomatic relations with Iran, have folded sleeves to support Iranian flood victims or at least reacted at the level of expressing condolences. Beside that, international assistance by EU and some other European countries show that out of these two flood hit neighboring countries who have been damaged evenly, the EU countries have merely helped Iran. But no remarkable assistance have taken place in Afghanistan to flood hits from domestic sources, regional and trans-regional countries. According to available data, 176 people have been killed in different Iranian cities particularly in the south. In Afghanistan, the State Ministry for Counter Natural Disasters stated the casualties 104 and 17 missing, no other official data have been released. But it has been said that due to lack of government access to rural areas as well as due to insecurities, the data of casualties might have been higher in Afghanistan than the released data. In both countries, countless number of residential houses and arable lands have been destroyed. According to UNOCHA, only in northern Afghanistan, about 42000 rurals have been displaced and many transportation roads have been destroyed. The high volume of damages, casualties in both countries have been unprecedented at least in the last half a century. In Iran, the news on floods in this period have been at the headlines of the world media. International assistance are of the most important factors of tackling the people affected by natural disasters in the world. Although Farzana Bazerpor a member of M.S.F, in an article has addressed Iran sanctions, its political isolation, weakness of diplomacy and gesture of national arrogance of Iranian rulers and beside these, fear of other countries of US sanctions as the main reason of no relief supplies to Iranian flood hits. But the international assistance to both countries flood hits are not comparable. Following the recent floods in Iran, the EU commissioner for humanitarian affairs Kristos Estilianids reported on supply of a € 2.1m relief aids to that country. The US who has the worst diplomatic relations with Iran, in a statement announced that its ready to help Iranian flood hits through ICRC and different bodies are allowed to send their international aids to Iranian Red Crescent Society. Turkey and France expressed their cooperation and sympathy with Iranian people. Austria, UK, Finland, Germany, UAE etc expressed their readiness and said that they are seeking a joint mechanism to support Iranian flood victims. Iranian political partners, China and Russia are also interested to support Iranian people. Amid these reactions, share of Afghanistan that has sustained even and same damages to Iran, is almost zero in international reactions. Only in some parts particularly those areas in which IDPs were present, few international bodies in Afghanistan assisted tents to affected people. Even internal reactions in Iran were different from Afghanistan. Iranian spiritual leader ordered that 5pc capacity of national budget should be used to help flood hits. The Iranian government plans to exploit banking accounts for compensation of flood damages. No news are available about abovementioned facilities in Afghanistan. 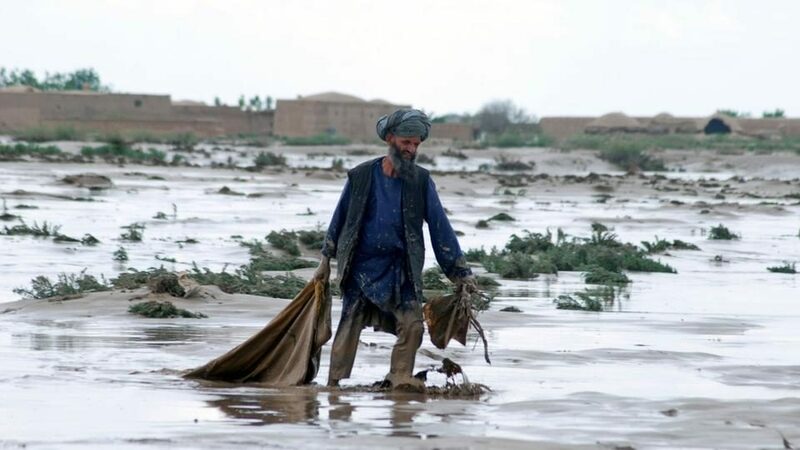 In Afghanistan major aids to flood hits were restricted to emergency aids, while tens of thousands houses, animals, and agricultural lands have been annihilated and people believe that it seems that the government has no determination and capability to support flood hits let alone compensation of damages. Why reaction to both countries flood victims have been different? Responding this question, lecturer of international relations in Herat University Zalmay Malyar said, humanitarian assistance to Iran and lack of world community attention to Afghan flood victims have different reasons. The first reason could be Iran’s political situation under new regional conditions. He added, the second reason could be nationals born Iranians who are living in European and American countries and propagate and lobbying for Iran while this is not taking place by Afghans living outside the country. According to Malyar, some countries who have hostile relations with Iran, avail this situation as an opportunity to establish contact, reduce hostilities and expand communications due to Iranians upper hand in the middle east particularly serious role of Iran in Yeman and Syria wars while Afghanistan lacks this role. He added, Iranian audiovisual media have higher covering power than Afghanistan media that causes increasing attention to Iran more than Afghanistan. The power of diplomacy team in Iran to attract public opinions and attention of foreigners to Iran is much higher and stronger while Afghan diplomacy team lacks this capability.